In the Knowing the State of a JavaFX Script Animation post I showed you the more succinct syntax for controlling animations. Now I'd like to show you some improvements to the TetrisJFX program that I've been developing in this blog, including switching to the new animation syntax. 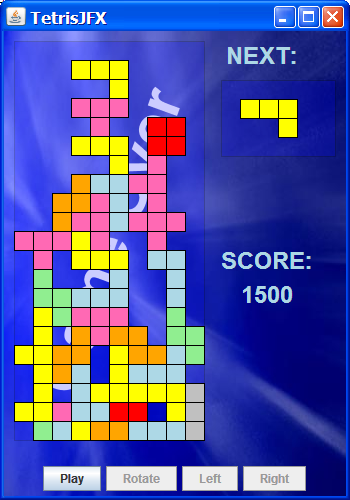 Here is a screenshot of the TetrisJFX game after the blocks stacked up to the top and the game is over. By the way, Bruno Ghisi (a fellow Java Champion) and Lucas Torri have developed a Java Bluetooth Framework called Marge. Using that framework they developed a mobile phone game controller for this TetrisJFX program. You can see a video of this in action in one of Bruno's blog posts. A preview area in the upper right corner that shows the next tetromino shape that will drop. Scoring is more Tetris-like, in that each tetromino is worth 25 points when it is finished dropping, and each row that fills up is worth 100 points. Full rows are removed from the playing field and the tetrominoes above are moved down. The button on the left toggles between Play and Stop. If you choose to Stop the game, "Game Over" will appear in the background, followed by which pressing Play will start a new game. When the tetrominoes stack up to the top, as shown in the sceenshot above, "Game Over" appears in the background and the game stops. Here is the code for this version of TetrisJFX. Note that I've added a new class named TetrisNextShapeNode that shows the next tetromino shape to drop. * The active tetromino shape type. * and represents the row in which the pivotal block is currently residing. * cells in the playing field) updated to reflect reality. * located, as well as the former angle of the tetromino. * held in the model, so don't have to be passed in. * cells in the next shape preview area) updated to reflect reality. * of tetromino (Tetris piece). * the one around which the tetromino will rotate. * Note that the "O" tetromino type doesn't rotate. * but the cases are simple enough to use if/else expressions. You may have noticed some TODO comments in the code, which will remind me to do some refactoring and add some enhacements (like create a button that will accelerate a tetromino's rate of decent). If you have any question, please post a comment. Also, if you'll be at JavaOne 2008, please attend my JavaFX Script Progamming Language Tutorial session and introduce yourself afterward!